I’ve been in schools where they had Teacher of the Week awards, but the teachers were selected randomly. Teachers knew that they didn’t receive the award for anything that they were doing, but rather because they got lucky to have their name drawn that week. This kind of teacher recognition award is good, but not as effective as it could be, especially if we’re trying to create a climate where teachers and staff feel appreciated. At the beginning of this month (Feb. 2015), I asked my principal if I could implement an idea I had for teacher recognition. The idea came to me after reading Simon Sinek’s book, Leaders Eat Last. According to Simon, there is a chemical that is produced when someone does something nice for another person. This chemical is Oxytocin. What I learned, however, was that not only is this chemical produced in the person who is the beneficiary of the compliment or good deed, but also in the person who is doing the good deed. The feel-good chemical is also produced in anybody who witnesses the act. Think about that. One good deed will produce positive feelings in at least three different participants. Teachers work hard. They are increasingly being asked to do more with less. The pressures and demands on teachers can have a way of diminishing that enthusiasm that most teachers have when they begin their careers. Teaching, for many teachers, can become a job, and it’s easy to not do their best work. As administrators, I believe we have to do everything we can to maintain an atmosphere of appreciation on our campuses, so teachers and staff can continue doing their best work. Teachers need to be reminded of the amazing job they do in the classroom every day. 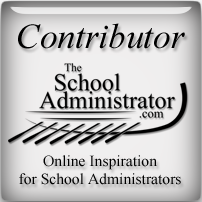 They have to know that we as administrators appreciate what they do, that we understand the pressures they’re under, and that our primary focus is creating and maintaining a climate where they are valued, trusted and supported. I would send out an email at the beginning of the week asking teachers and staff to nominate a colleague for the Hero of the Week award. Teachers would email me the name of their nominee, along with a reason why the teacher/staff member was nominated. I would immediately (or as soon as possible) forward the nominating email to the nominee. At the end of the week, I would collect all the names in a hat, and randomly select the Hero of the Week. The winner would be announced in a mass email to the staff. Attached to the email would be a Word document where I had compiled all the nominees and the reasons for the nominations. The weekly winner would have his/her photo prominently posted in the school lobby. That staff member would also be given a preferred parking spot in the staff parking lot. The winning staff member would also be eligible for the Hero of the Month award which would include a $25 gift card. It has been a month so far, and the response has been amazing. Teachers and staff members are telling me that they feel honored to be nominated. What I’ve noticed is that teachers who have been nominated will in turn, nominate others. It has been inspiring to see how teachers recognize each others’ efforts. We all like getting pats on the back. It makes us feel valued and it gives us that energy to keep doing what we’re doing. It’s biological. Based on what I leaned in Simon’s book, by letting people know who nominated who and then sharing the nominations with the staff, this good-feeling chemical, Oxytocin, is being produced over and over again. It goes without saying that I, as the one reading and sending these positive messages, am getting a good dose of Oxytocin as well. My goal with this was to help create a culture where teachers and staff can be reminded of the good things they do, that they know that they work in a place where they are appreciated, not only by administration, but by each other. When I brought this idea to my principal, I was a little worried that we would have a difficult time finding out where to get the funds to make it work. It has taken a financial commitment – $25 for the monthly gift card, frames for the lobby, etc. I was not too surprised, however, when my principal agreed quickly to the idea. I am grateful to be working in a place where I, and my crazy ideas, are valued and encouraged. Valuing and encouraging out-of-the-box thinking is what great leaders do. What kind of teacher recognition program do you have at your school?